Celebrated scientist Stephen Hawking had once said that it is essential that humans colonise space. His dream may turn into reality as a group of scientists revealed on 28 September that liquid water flows on Mars. "Our quest on Mars has been to 'follow the water', in our search for life in the universe, and now we have convincing science that validates what we've long suspected," said John Grunsfeld, astronaut and associate administrator of NASA's Science Mission Directorate in Washington. "This is a significant development, as it appears to confirm that water - albeit briny - is flowing today on the surface of Mars." What is the newest finding? A team of eight researchers from five universities used images from the NASA's Mars Reconnaissance Orbiter, in four different locations, and found evidence of salt water. Their research, published in Nature Geoscience, strongly supports water activity on the Red Planet. The four different locations where water has been foud are Palikir Crater, Horowitz Crater, Hale Crater and Coprates Chasm. These craters are called Recurring Slope Lineae (RSL) - narrow dark streaks appearing during warm Martian months - and are formed due to hydrated salts. Here's NASA's animation of the flow on Hale Crater. Different forms of salts like magnesium perchlorate, magnesium chlorate and sodium perchlorate have been detected in the pictures. Salt helps lower the freezing point of water and evaporation rate, which stabilises surface water. It is impossible for pure water to subsist on Mars as it evaporate or freezes fast due to the extremely arid weather conditions. What is the origin of the water? The origin of the water could not be confirmed by the study. It is speculated that water is formed either by the melting of ice or salt. The regular supply of water to form RSLs is also unconfirmed. Another postulation is that there is a seasonal discharge of a local aquifer to supply water to the RSLs. Lead reseracher Lujendra Ojha of the Georgia Institute of Technology says: "We found the hydrated salts only when the seasonal features were widest, which suggests that either the dark streaks themselves or a process that forms them is the source of the hydration. 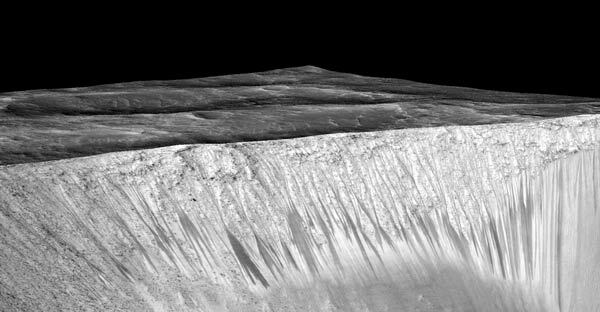 "In either case, the detection of hydrated salts on these slopes means that water plays a vital role in the formation of these streaks." 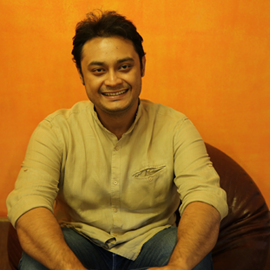 "Liquid water is a key requirement for life," says Ojha. According to him, this finding is a clear indication that the planet is more habitable than previously thought. 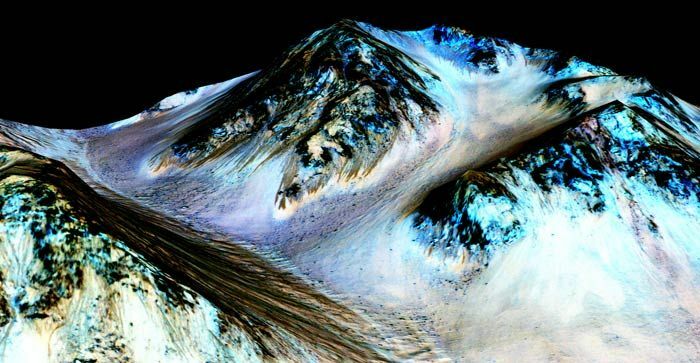 "When most people talk about water on Mars, they're usually talking about ancient water or frozen water," Ojha said. "Now we know there's more to the story." The Red Planet has always been a subject of romanticism for all global space agencies. Billions of dollars have been invested - resulting in success and failures - and often Mars missions have been a matter of national pride. Mars has some striking similarities with Earth. Mars has seasons like winter and summer, is in the ideal zone for life as far as distance from the Sun is concerned, and rotates on its axis every 24 hours and 37 minutes. Due to such similarities, there is speculation about life on Mars. Explorations have been made to retrieve soil and rock from the planet, as there is a desire to colonise it as the final destination of humanity. There are purely political reasons associated with global cooperation and national pride which drive Mars exploration. In reality, the trouble in colonising Mars lies in radiation - which is supposedly 20 times more than on Earth. This can increase the chances of getting cancer by 3%. Presently, there are around eight stakeholders who are planning to colonise Mars - from USA, Russia, China, Europe, to non-profit foundations to even Elon Musk, through his organisation SpaceX. However, the most interesting initiative is that of Mars One, an organisation which plans to settle 24 people permanently on Mars. The programme will be broadcast and funded through advertisements. Mars One intends to use a series of missions from 2020 onwards to build infrastructure, with the first manned crew planned to be sent in 2026. With the latest hypothesis of water availability, all these programmes will definitely be reinvigorated.